If you're not among the lucky few people who will get to bid farewell to late astronaut Neil Armstrong in person Thursday (Sept. 13), you can still watch the proceedings live online. Armstrong, the first person ever to set foot on the moon, will be memorialized Thursday at Washington National Cathedral in Washington, D.C., in a ceremony that starts at 10 a.m. EDT (1400 GMT). The few public passes to the event have been snapped up, but it will be broadcast live on NASA TV and the Washington National Cathedral's website, space agency officials said. When Armstrong's boot crunched into the gray lunar dirt, "it was one of the country's proudest and most riveting moments," Nelson added. Many dignitaries are slated to attend Thursday's ceremony and pay their respects to Armstrong, who died Aug. 25 following complications from a recent heart surgery. The VIP list includes NASA chief Charlie Bolden and deputy administrator Lori Garver, along with a number of current and former astronauts, NASA officials said. Bolden and former Secretary of the Treasury John Snow will offer tributes, as will Apollo 17 commander Gene Cernan, the last person to walk on the moon. Armstrong's Apollo 11 crewmate Michael Collins will lead prayers, and the Right Rev. Mariann Edgar Budde, bishop of Washington, will give a homily. Singer-songwriter Diana Krall will perform "Fly Me to the Moon" at the service, according to Washington National Cathedral officials. During the ceremony, NASA chief historian Bill Barry will participate in an online chat, giving readers more information about the speakers and outlining their relationship to Armstrong and the space agency, officials said. Armstrong became an American icon when he stepped onto the lunar surface on July 20, 1969. The words he said upon doing so are among the most famous ever uttered: "That's one small step for [a] man, one giant leap for mankind." 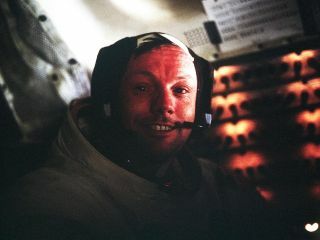 Neil Armstrong and fellow Apollo 11 astronaut Buzz Aldrin spent more than 21 hours on the lunar surface, while Collins orbited above them in the mission's command module Columbia. The three men returned safely to Earth on July 24, 1969, fulfilling a pledge made by President John F. Kennedy eight years earlier and notching a huge victory for the United States in the Cold War space race against the Soviet Union. Armstrong was memorialized Aug. 31 in Cincinnati, but that was a private ceremony limited to friends and family. Thursday's service serves as the nation's send-off to one of its most famous citizens. To watch the ceremony on NASA TV, go to http://www.nasa.gov/ntv. Washington National Cathedral's feed can be found here, and the chat with NASA chief historian Bill Barry can be accessed at http://www.ustream.tv/nasahdtv.